To thine own self be true is on the outer edge. The triangle has the words unity service recovery. 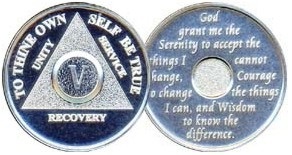 The center is raised and has the year in Roman Numerals The reverse is the short serenity prayer. Please note - these are a .999 solid silver satin finish coin. We have been told on some computers it may look like a darker or painted finish. It is not. It is a ½ ounce silver coin.